Anja was not a gambling man, so his introduction to Tall Johnny’s was a new and fascinating experience. Risk takers were prevalent in Sunberth. As Jeb had explained to Anja, when you had nothing to lose and everything to gain, betting your money seemed like a solid investment. It was just another drug, another kind of drink. An addiction to numb the pain and make you think you had a chance at a better life. All lies of course. But what did you have if you didn’t have hope? Anja couldn’t begrudge this establishment. It provided a service that was needed. Hope, fake or no, was too powerful to be cast aside. If it gave these people a will to live than who was he to judge it? Anja nodded politely to the twin Akalak’s guarding the entrance, to which he recieved an imposing stare in return. The statement was clear; don’t cause trouble. They had nothing to worry about with him, but there was no way for them to know that. Politely Anja proceeded through the double doors and was not stopped. The inside of the casino was immaculate, a stark contrast to the deprivation just outside the doors. Anja stepped past the gold plated statue, giving it a brief nod of respect to the clear god symbol, and navigated himself through the dark mahogany wood furnishings and ignored the judgemental if uncertain looks of the well dressed patrons. Anja was looking for one man in particular. Jeb had given the spiritist a detailed description of the man, and Anja was confident he would know him when he saw him. And such as it was. Anja found Tall Johnny, true to his name, tall thin and elegantly dressed. The man was sitting at a card game surrounded by beautiful, finely dressed women and smiling with a charming air as he dealt a hand to a group of chuckling rich men. Upon sighting Anja’s approach his eyebrows rose in recognition and he stood up and extended a hand to Anja. Anja could see the surprise and confusion in his customer’s eyes as Johnny so politely greeted a worn and perhaps a bit scraggly man. “That would be me,” Anja replied, shaking Johnny’s hand firmly. The surprise on the guest’s face, if anything, increased. “Aye,” the man agreed, and glanced back at his curious customers. “I’ll be back shortly, gents. Just hang tight for me a bit.” His charming smile seemed to soothe any ruffled feathers, and Johnny lead Anja out of the room and into the adjacent area. The new place was a fierce contrast to the other room. A massive cage sat in the center of the room, with amphitheatre style seating surrounding it. The scent of blood lingered in the air and teased the back of Anja’s throat. He brushed one finger against the side of the cage and his finger came back with dried blood. “This place must be very haunted,” Anja commented, rubbing the dried blood between his fingers. “Can you open the cage for me?” Anja asked. Johnny nodded and did so, pulling out a ring of keys to open the door and departed. Anja stepped into the center of the cage and breathed the scent of death. Oh, but it was heavy here, like a weighted shroud. Many people had died here and many more would. A cycle of death. Anja looked around, senses taut for that familiar chill of the dead that ghosts emanated as they materialized. Last edited by Anja Nightwatcher on July 22nd, 2018, 9:49 pm, edited 1 time in total. Meriann was weary to the core of her being. For the past few days she had searched without luck for the man named Darvin, once Kelski's what? She had finished asking questions about the circumstances of the night of her death, but she wished to speak to the drug-dealer and ask him why? That particular question was most frequently in her mind. Why had things turned out the way they had? Why did people consider death, murder, and killing an option? Why, even, did people suffer in the city? That latter question seemed closer and closer to her mind, because as she moved unseen she saw things that she wished she hadn't. People suffering in huge numbers, all because of Sunberth and the crime and the gangs and the pestilence and hunger. She was weary of these things, and depressed that she was caught up in the very middle of it without escape. She still wanted answers. Finally, a few days before, she had found herself numb and tired enough not to care about venturing back to the place she had died, and so she had passed through the doors and seen the place. On the surface, Tall Johnny's was full of glitz, glamour even, which looked so starkly out of place to the teeming streets that Meriann had simply stood and stared with rapidly flickering eyes for what must have been a bell. Yet as she looked closer, and peered within every corner (still searching for Darvin or even Kelski, though she was unsure if she could face her killer even now), she began to see the grime of Sunberth penetrating even here. She watched a man thrown out onto the street, left with nothing but bruises. She saw snide laughter and desperate gambling, men clutching cards as if they would provide them an escape from the city. Then, almost as if she was magnetically attracted against her will, she drifted to the fighting pit. Within, fighters tore at each other. Some were more professional than her and Kelski's fight could ever have been, and she watched those with a fascinated horror. Then, on the same day, she witnessed the first death in the ring, and everything had snapped into cold clarity. There wasn't much that she could do, any more, but in some ways she was more capable in death than she had ever been in life. As she watched a young man die, his wounds so horrible and deep that she could see the white of the bone beneath his flesh, she knew that she could not allow it. No more death, no more killings in Tall Johnny's. People could have their fun, and their games, but Meriann couldn't stomach another being killed in the same place as where she'd died. She could barely remember the laughter from the crowd and the cheering and jeering, but she remembered her death clearly. The pain most of all, and the sense of time boiling down to nothing at all. So Meriann haunted the fighting pit at Tall Johnny's, and as soon as she saw fighters going in for the kill, she possessed them. She was nowhere near skilled enough to possess them for any true length of time, but what she could do was distract and pull attention away from murder for long enough that the fight was over. She worked hard, so hard that her spirit burned and she could almost weep with tiredness, but her efforts paid off. Meriann had seen no more death, and it pleased her. Now that she was working, she felt driven, with a sense of purpose finally. First she'd thought to understand why people killed, but there were so many murderers hiding beneath the skins of ordinary people that she could never hope to understand it completely. That wasn't to say that she had given up, as such, but she now also knew that she detested murder for the sake of murder, and so she was waiting in the ring when a dark haired man stepped in and asked to speak to her. She was surprised. Meriann didn't know of spiritists and their propensity to dispel ghosts from their haunts otherwise she might have been more cautious. Instead, she materialised a few feet from the stranger, dragging a chilled cold with her like a cloak of winter. She was dressed in the clothes she'd been wearing on her death, but her eyes remained in her sockets, contrary to what Tall Johnny had told him. She had a wound in her abdomen that was dark with blood, but otherwise she looked... ordinary. Tentatively she smiled, and spoke, "What d'you want to talk about?" Her voice was clearly accented with the tones of the Svefra, if one knew of the sea-faring race, but quiet and strangely reverent in the dusty, bloody pit. Anja had not expected the ghost to respond to him, at least not immediately, but he was more surprised at the ghost’s appearance and demeanor. She was not as grisly as most ghosts he had dealt with, especially considering the manner of her death. She only bore a small, bloody, abdominal injury. But most interesting to Anja was how tenative she seemed. Anja hadn’t had reason to think that this ghost would be aggressive or violent. If anything, based on Johnny’s words Anja had expected the opposite. A pacifist perhaps. But the ghosts of Sunberth frequently raged, stewing in their bitterness and hatred. This one was different. Polite, intelligent, friendly even. The ghosts Anja had met so far in Sunberth hadn’t been much for conversation. “My name is Anja,” the spiritist introduced himself. Always courtesy first. The people of Sunberth didn’t expect it, and at worst it was good for a laugh. The warmth of Anja’s breath left a fog lingering in the air. “Might I have your name?” The ghost might feel a little uncomfortable around Anja. This was normal for the dead around Eiyons, and Anja did his best to soothe the feeling by keeping his voice calm and rhythmic. Anja gazed quietly around at the cage surrounding the pair of them. It really was a bleak place. The scent of blood and sweat mingled with the old and aching breaths of the dead, lingering in the air and catching in the back of Anja’s throat. The bars of the cage were tinted a burnished red, whether from rust or blood it was difficult for Anja to tell. The spiritist could feel his sensitivity to death stretched taut, like a rope ready to snap. Visions of death were shouting at the Eiyon to be heard, dozens of them competing for the privilege. Anja held himself back from them, knowing that the distraction would be too much and he would not be able to focus on what the ghost before him needed. She was hit with a wall of information all at once. Meriann flickered backwards and forwards between a growing sense of uneasiness and a feeling, gleaned from the way he spoke, that she didn't need to worry. He even told her as such, don't worry. The ghost lightly frowned, her eyes curious about the man but slightly fearful too. Scared of what he represented and the smooth yet honest way he spoke. He didn't seem real, somehow. The uneasiness that emanated from him was enough to set her on edge, although she remained as polite as he was. "I'm... Meriann." A hesitant smile dropped from her lips almost as soon as it had formed. Anja proposed, nicely enough, that they could move to a different place to talk. Meriann's eyes snapped wide and she shook her head violently enough to send her hair flying out around her like a halo before it settled back around her face in a grey-brown mess of nothing but soulmist. "No, we stay here. I'd like to stay here. Otherwise, someone else will die here, when I'm not here. I can't..- I don't want to let that happen." Meriann drifted closer so that she could see the Eiyon more clearly. He was a handsome man, she decided. 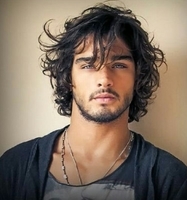 His dark hair was roguish but neat, and it lay in curly waves beside his tan face. His eyes were completely unreadable, but intelligent and bright. Meriann hesitated, but in the dim and murky hole that was the fighting arena, the questions were ready and willing to spill out from behind her mouth, from out of her thoughts. "A spiritist... What does that mean? Because I don't want to leave, not now. If you'd come to me before, if you'd found me before, then..." She blanched, as much as a see-through ghost can, and turned away. Her fingers twisted together protectively, and she breathed a long, cold sigh through her nose. "If you'd found me before I would have gone. But now I see death everywhere and although I was a failure in life, I will not fail in death." Her voice grew small and quiet as she paced to the edges of the bars. She fully materialised and urged soulmist into her fingers. The action came easier all the time, and she strummed her fingers over the cold, iron bars that enclosed the spiritist and the ghost in the deathly room. The metal thrummed with a dull, ringing sound as she walked around the edge, feeling the metal beneath her hand. It was a bittersweet feeling, but a necessary one. It reminded her that she could feel, to an extent. Nothing like real life, but something. "There is so much death in this city. I never knew, not when we were coming here, that it was such a miserable place beneath the surface. I never wanted to die here. In hindsight, I suppose it was inevitable, but I didn't want it to happen." Meriann rambled, but as she turned to face the man, her face was bleak and miserable. Inside she was thinking of her future, a life of stopping murder with no end in sight, and she thought it to be a good, noble aim. Her face portrayed something else. What she was feeling wasn't a sense of goodness, not really, but a feeling of awfulness. Once again, Meriann was choosing not to look to the future, too afraid of what she would see there, too afraid that she was being foolish once again. Instead, she resolved herself and gathered an inner strength. She nodded, and gazed at Anja. "But I won't pass on. I need to stop people dying." Meriann. It was such a pretty, lighthearted name. It spoke of sweetness, sunshine, daisies and laughter. Anja suspected that the name had suited the young lady once, before her life had been forcefully clawed out of her. It was difficult to associate that name with the figure now standing before him, but in a way it was suitable. Ghosts were such sad echoes of what they had once been. Aching, tormented souls, longing for rest but with no means to find it. When Meriann remained determined to stay in the cage, Anja nodded and made no attempt to argue. If staying here made her the least anxious, then this was where they would stay. The spiritist was quiet as Meriann sang her lament. He followed her gently with his eyes as she approach the bars and strummed on them sending their echoes through the room. An aching accompaniment to her sorrow song. When Meriann turned towards Anja and made her confident proclamation, Anja felt a surge of compassion rise up from his depths. It really was such a pity she had died, this woman and like this. Anja was not the judgemental sort, and in truth he considered every ghost he had encountered here in Sunberth to be a victim of some kind or another, no matter the circumstances of their death. But Meriann was unique, truly. Her death was not so peculiar, and even now Anja could feel dozens of visions of death in this room alone clambering for his attention, aching to be heard. No, what was different with Meriann was her reaction to her death. She wasn't seeking vengeance, she wasn't fighting to right wrongs. She just wanted to stop others from dying as pointlessly as she had. Anja thought, with a grim kind of sadness, how tragic it was that the first truly selfless person he had met in Sunberth was already dead. Her regrets only bolstered the man’s resolve. If any spirit deserved to rest easy, it was her. Unfortunately, her desire was not something that could be granted. It was fortunate that he had been able to find her, for her wish could never be granted. Moving this spirit on would require a soft touch that only a spiritist with compassion could manage. When he spoke, it was with kindly words and tone, but Meriann found it difficult to absorb the meaning behind them. After all, hadn’t she just told him that she wasn’t going to move on? Unfortunately, Meriann was as stubborn in death as she had been in life, and she found it hard to take no for an answer. She glanced longways at Anja, then quickly turned away. He soulmist flickered once, like a lonesome lick of a tiny flame. ”I’ll just follow him, then. He can’t run from me; I’ve got all the time in the world.” She sighed and moped to the corner of the cage, ignoring most things except the movements of the solemn Spiritist, who she watched without turning her head. Gone were the nervous tics and the scratching of the eyes that she’d picked up last season. She had a purpose now, and she meant to stick to it. ”My path is my path, I chose it, I’ll stick to it. I… I won’t change my mind.” Yet, even with the conviction in her voice, she still felt torn inside. One very small part of her actually listened to Anja’s message, and heard the implied foreverness of death and of Dira. The long road of murder, pain, and suffering stretched out in front of her. She wasn’t some brave woman with a noble goal of self-sacrifice. She was simply a lonely, horribly scared dead woman, afraid to live a life without purpose. Afraid to face the unknown. But she wouldn’t admit that, not yet at least. Instead, she ignored the small voice that agreed with Anja. ”Why do you do what you do? A Spiritist… You get rid of ghosts. I chose to stay in this world. I don’t want to move on, at all. If you’re as kindly as you make out, wouldn’t you respect me?” Affronted, Meriann drifted closer to Anja, despite the rumblings of dread at his proximity, and peered deep into his eyes. Her eyebrows were drawn into a dark thatch as she scowled at him. oocUgh, sorry for the shortness. Anja watched the ghost turned away from him, stubbornness exuding from her form in an almost tangible cloud. Anja watched in silence as she moved to the corner of the cage, and spoke her denial of his offer. Firmly, fiercely even. But despite her words, and despite her tone, Anja could feel the shadows lingering behind her intent. He knew she wasn't happy doing this. Being a ghost was a miserable existence. She would never be happy so long as she continued on this way. That stubbornness was admirable, but in all truth it was entirely too selfless. Anja could almost see it: a woman stubbornly attempting to prevent murder, growing stronger over time. But as her power grew, surely her resentment would grow as well. She couldn't save everyone. Eventually, Tall Johnny would find a way to run his death games elsewhere, or he would find another less kind spiritist to Dust Meriann and remove her influence for good, never allowing her to reincarnate as she should. Anja didn't want that for anyone, but especially not her. She deserved a sweet release. In all the words and explanation that came from his mouth, it was the mention of a new chance that dug its sharp claws into her consciousness and buried the bright seed of desperate hope into her mind. She felt sorrow and pity for the man who had lost his family, but even though her face wrinkled into a facsimile of sympathy, it was hollow, for Meriann was not only stubborn but self-centred. Then, suddenly, she realised it. The ghostly woman’s face grew pale- that was, paler than it already was. Her family… What must they be feeling now? Why had she not sought them out? She’d blanked them from her mind, and whether or not she’d done it for the right reasons didn’t matter. The Oceanroars still lived, in Sunberth or on the sea or gone to another city. Her sister would have been full of grief, both at the loss and having to tell the family to move on. They’d already lost the Kelpfires, disappeared to gods-knew where. Now, they’d lost a sister and a friend. Meriann’s eyes grew bright with artificial tears. She stood a little way away from Anja and looked at him without truly seeing. Her emotional state, clearly visible in the wavering patterns of her soulmist, sunk down into grief. For the first time, it wasn’t a sadness for herself and her own state, but for her family, wherever they were now. Finally, finally Anja’s words were getting through to the selfish ghost. She sank to her incorporeal knees. She wept further tears, but the emotion was weak and lacking. Sadness was an almost constant state, for herself, for her wretched position on the surface of Mizahar, and now for the family she’d all but forgotten. She was selfish, and though she still cared, there was only so much sadness she could be bothered to show. Gone past crying, she straightened and looked up at Anja. Anja saw a storm of emotions on the ghost woman’s face. First a stunned surprise which was was washed away by a flood of sorrow. Anja didn’t need to see the tears on the woman’s face to know the intensity of her emotions in that moment. They radiated off of her, as tangible as heat or the static amidst a storm. Something Anja had said had gotten through that shield of stubbornness. She spoke of her family. Of wishing to see them. A person named Murray. Family, of course. This was a topic the pair of them could share, could relate to each other on. Anja listened seriously to the woman’s question and took a long moment to organize his thoughts in his mind before he chose to speak. She was silent for the moment after her outburst. Somehow she felt as if she was seeing Anja for the first time. She quietly studied his black hair and his lips as he spoke. What he said made sense. Her family would heal, maybe they were already on their way to readjusting. They were nothing if not hardy creatures. Meriann rose to her feet and as she did, nerves hit her. The butterflies in her stomach were mixed with something else too. Perhaps it was excitement. Or fear. Whatever it was, whatever this moment meant... She could feel the inevitability creeping up, like frost across glass on a cold Winter's night. It was not only the sadness of inevitability that snuck up, but hope. That emotion felt strange in itself, but she could feel it nonetheless. She raised a hand and softly reached for Anja, to touch his arm or his face. Just to feel the warmth of his skin, should he let her. If it were any other telling her they'd search for the goodness in the city, she probably wouldn't believe them. But the Spiritist had an aura of honesty about him that couldn't be faked. When he said he would do something, Meriann believed him. Swept with a strange mixture of relief and apprehension, she brushed the hair from her face and let her thoughts settle. Her soulmist relaxed until it was almost stationary whilst she mulled over Anja's words, but the tempestous ghost was convinced. Finally she spoke. "Thank you, Anja. I believe you. I suppose... I believe in you. Please... Though you peddle in the dead, don't allow death to overcome you and sweep you up in all this..", she broke off and gestured to the hated walls of Tall Johnny's, though she implied the city in general. "I'm ready to leave. I.. There's nothing here for me anymore. I want to see what's next. I think." She looked confused for a moment. When her face cleared, there was a new look about her. It was recognisably lifelike, her eyes sparkled and there was something of the old, playful nature in her quirked lips. "Good bye, Anja. Thank you." She turned on her heel, and wondered what was next. Before she really had time to think, she dissolved, a kaleidoscope of greys, shimmering into nothingness in the dark. The last thing that Anja would see was her eyes, shining with surprise and fear and excitement, before Meriann was gone from the world. I hope the ending is okay. You've been a wonderful thread partner, far too wonderful for me. I feel we could have continued a tiny bit longer but I thought it was also prudent for me to end it sooner rather than later, considering the time it's taken because of me anyway. xD If you wouldn't like me to grade it, let me know. Otherwise I'll grade it in the next week.